So, you got lucky and pulled a Loot Card from a booster pack..? Or, maybe you just scored a great deal on some WoW TCG Loot through ebay..? Redeeming WoW TCG Loot Cards for... actual WoW Loot! Now that you have your shiny WoW TCG Loot Card in hand, here are the steps you need to perform on your way to redeeming this piece of cardboard for some exciting new WoW treasure! Gently scratch off the metallic film on the back of the card, revealing the precious loot code. Go to the promotions page on World of Warcraft website to redeem your WoW TCG Loot Code for an in-game loot code. Print out or write down the in-game loot code you receive. Log in to your valid World of Warcraft account. Hop on your flying mount, boat, zeppelin, gryphon, Magic Rooster, whatever... but get your toon to Booty Bay in Stranglethorn Vale. Once there, find a goblin by the name of Landro Longshot. He's standing on the dock with two bodyguards, near the Old Port Authority, and just opposite the Booty Bay Auctioneer. Landro Longshot and his goblin bodyguards are easy to spot. He's wearing a flamboyant purple shirt (or perhaps Armor of the Fang), along with having what looks to be a purple "gem eye" (as opposed to a glass one). Landro's bodyguards are both wearing the distinctive Tabard of Flame. 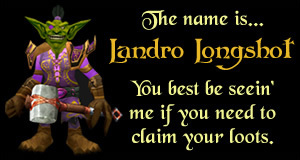 Speak with Landro, and he will introduce himself. Landro is part of the Black Flame - a neutral party to all factions. Next, select the item for which you have the loot code. Enter in the code and enjoy your new in-game loot! Your loot item will automatically show in your inventory and be available for use. For more information on redeeming WoW Loot, please read our Frequently Asked Questions.